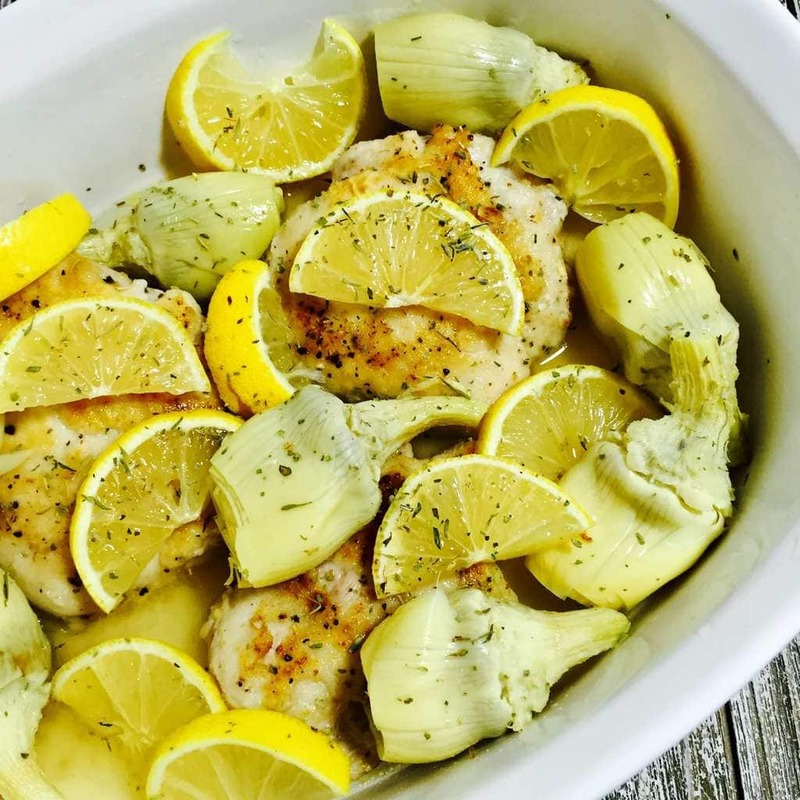 This recipe for Lemon Butter Chicken with Artichokes is so easy to make, and it’s also deliciously healthy for you. 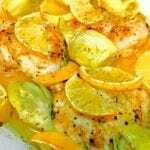 Lemon Butter Chicken is really a simpler version of my Mediterranean Lemon Butter Chicken. But the delicious combination of chicken, lemon, butter, garlic and artichokes is still all there. It’s just lighter and simpler to make. I think the tang of the artichokes really just makes this dish. Instead of going through the time and trouble…and expense…of cooking whole artichokes, I’ve discovered Trader Joe’s Artichoke Hearts. They’re absolutely perfect from the size, to the tenderness, to the flavor because they’re packed in brined water. So now, because I love artichokes more than anything, my pantry is happily stocked. What would we do without Trader Joe’s? In this recipe, you certainly can use regular sea salt and pepper, but to kick up more flavor I substituted Jan’s Chunky Mixed Up Garlic Seasoning for the salt because it also includes onions and other spices. And also I substituted Jane’s Steakhouse Seasoning for pepper. This predominantly pepper blend also has lime and garlic, which works beautifully with this dish. 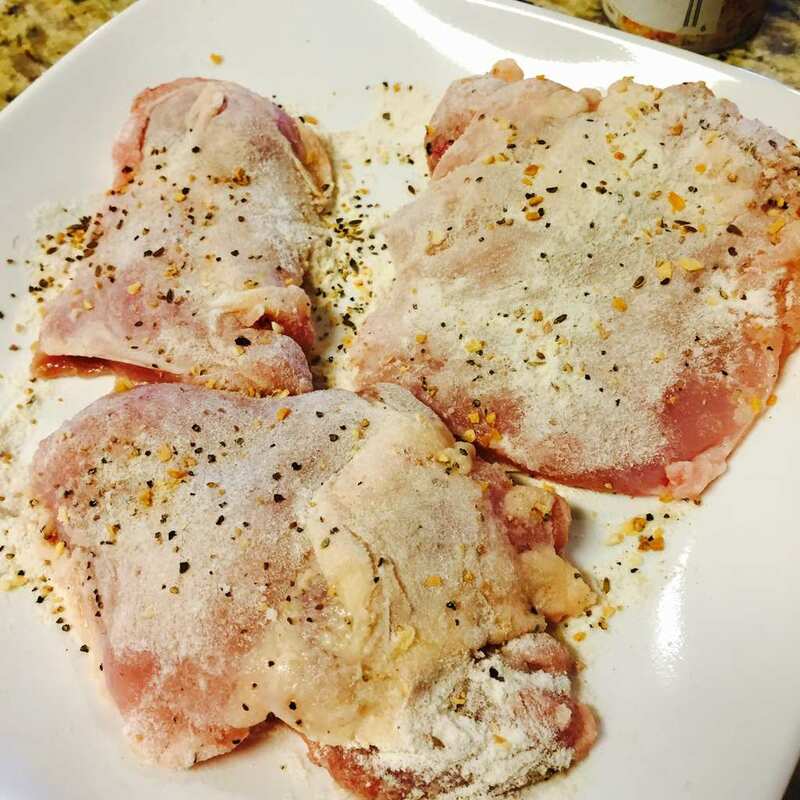 Begin by dredging the chicken thighs into a mixture of Wondra flour, garlic salt and ground pepper. Then brown the chicken in a little olive oil until brown on one side, about 2 minutes over medium high heat. Then flip over and continue to cook 2 minutes more. This not only gives a nice crust on the chicken, but it intensifies the seasonings even more than just sprinkling over the top. Then simply add the chicken to a baking dish, tuck the lemon slices around the chicken, then add the artichokes. In a small bowl add the chicken broth, minced garlic, melted butter and thyme and pour the broth mixture over the chicken. Bake for 40 minutes until the chicken is browned and cooked through. It should register 165 degrees on a meat thermometer. When finished remove from oven, cover it with foil and allow it to rest for 10 minutes. This step helps the chicken to be even juicier. 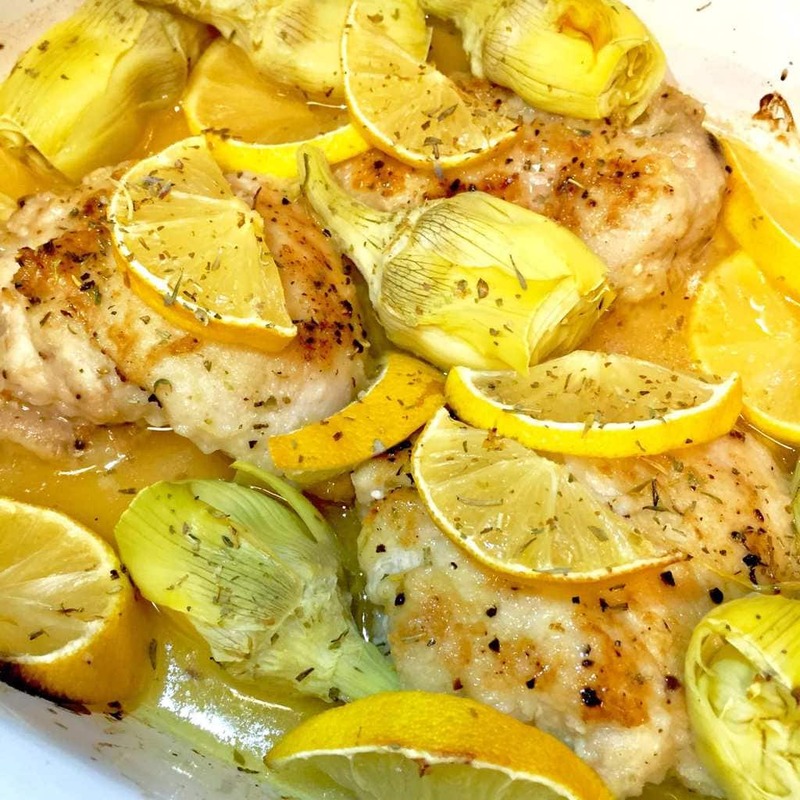 Lemon Butter Chicken with Artichokes is so easy to make and it’s also deliciously healthy for you. Add flour, salt and pepper to a shallow bowl and mix together. Dredge chicken thighs into flour mixture on both sides. Add olive oil to frying pan over medium high heat. Then add chicken thighs and cook for 2 minutes until lightly browned. Turn over and cook 2 more minutes. Add browned chicken thighs to baking dish in an even layer. 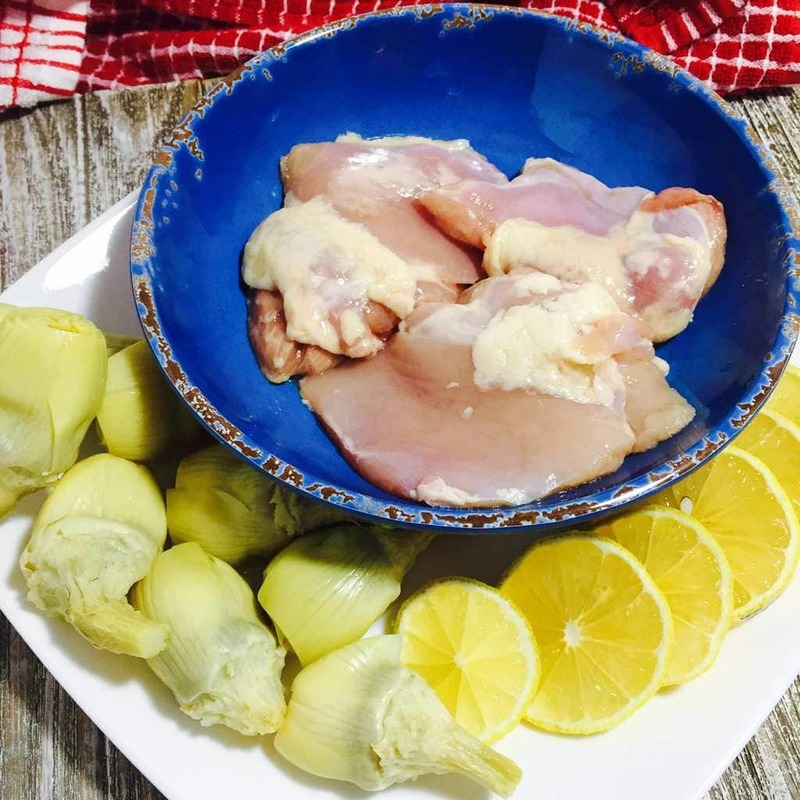 Top chicken with artichokes and lemon slices. In a small bowl, mix chicken broth, minced garlic, melted butter and thyme. Pour broth mixture over chicken. Bake 40 minutes until chicken is browned and cook through. It should register 165 degrees on a meat thermometer. Remove from oven, cover with foil, and allow to rest 10 minutes. If you liked this recipe, please leave a comment below and be sure to pin this on Pinterest!